In the spirit of “hike your own hike”, I’d like to start by saying that this is a 100% guilt-free recommendation. The choice of how, what, when and where to hike is a personal choice and hiking for charity is no exception! This “how-to” is meant to serve as a general set of tips and recommendations based on my experience and research so you may notice me mention a few specific charity names in this article, but I have no intentions of asking you to support a specific charity. I would much rather equip you with information so you can hike your own (charitable?) hike. How about this for a starter: Do you genuinely want to hike for charity? Some people take to the outdoors as a reprieve, a complete rest from any pressures life has currently bestowed upon them. I think it’s worth taking a moment to be honest with yourself about whether you might feel pressured during your hike by fundraising for a charity. If you promise a certain mileage goal (whether day-hike, section-hike or thru-hike), will that be a problem for you logistically or add unwanted stress? Some people may prefer to hike without any ties whatsoever, including charitable organizations. On the flip side, when the hiking gets tough, you may find strength and comfort in the fact that every step you take is making a difference. The bottom line is that giving this some thought might save you some headache or heartache in the long run and the first question you may want to answer. If you decide to give it a go, here are some helpful tips! I recommend planning your hike before anything else. Planning your hiking trip first allows you great flexibility in approaching a charity. You will be able to present your upcoming hike to the charity as a fundraising opportunity in great detail. Speaking to your charity or possible donors without being hypothetical about your trip will go a long way towards attracting support and funding. Hiking for a charity you are passionate about will add to your hiking experience, not detract from it. It’s nearly impossible to hike for a good cause without some effort or planning, but you won’t mind the extra preparation if it’s something you believe in. In fact, you’ll theoretically be happier than ever as you’re doing TWO things you love at the same time: Hiking + Supporting a good cause. If you’ve read my bio, I hope you could hear the excitement in my desire to touch the lives of other people through my hiking experience! If you’re not sure what charity excites you, take a look around – there’s plenty! I don’t recommend picking one at random. The exception may be if you can be very “hands-off” with the preparation (more below on a SUPER easy method) for your charitable effort. No one wants to give away their hard earned money and find out it was all a hoax. At the same time, you won’t want all your hard work to fall through and have to return donations to people for some strange or unexpected reason. These are just a few reasons I strongly recommend getting official approval for any fundraising or awareness efforts you embark upon for your charity. The approval you need will vary depending on the charity you pick. Some organizations required paid memberships before you partner in any way, whereas another organization may only ask you to make a username and password and provide everything else you need. Pick your charity THEN dive into the details, but save yourself some headache and make sure everything is by-the-book. Regardless of how much money you raise (or don’t) and/or how successful your awareness campaign went, do yourself a favor and make a conscious effort to leave it at the trail-head. Even if you’re super excited for your cause, try not to over-promise mileage goals or other on-trail perks for your charity. Balancing those things with the demands of the trail and your personal hiking experience can get burdensome if you let them. Don’t get me wrong, I kept my charity in mind on my hikes and was usually able to deliver some good social media content and make a reasonable mileage goal, but hinging your donations on those things or over-promising to your charity can end up building resentment. Make realistic goals and keep it relaxed and easy when it comes to on-trail charity efforts. Hike your own hike still has its place and doesn’t have to be abandoned for the sake of charity. 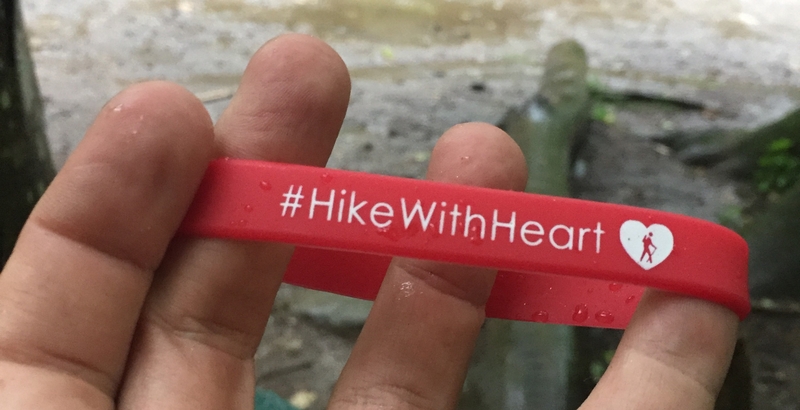 I started a small fundraising effort called #HikeWithHeart because I wanted to raise money for Hearts of Many Colors, a faith-based initiative supporting children and families in Haiti. The mission had no current fundraising effort for me to “join” so I personally contacted (email and phone) the United States representative and offered a description of what I wanted to do. I then asked them to set up a special page on their website so that all my donors could send the money DIRECTLY to their organization. I supplied information about the Appalachian Trail, my personal hiking trip details, bio etc. and they put up the page. I was transparent about the fact that I had no idea how much money I would raise. They agreed and we set up the official web page. I then set out publicizing my effort to friends, family, churches and other organizations I connect with in my daily life. Doing it this way built trust with the charity as well as potential donors. While this is probably the “hard way” to setup a charity hike, I still managed to raise a few hundred dollars! I had a short (20+ mile) hike planned in October and looked around for a charity I might support. 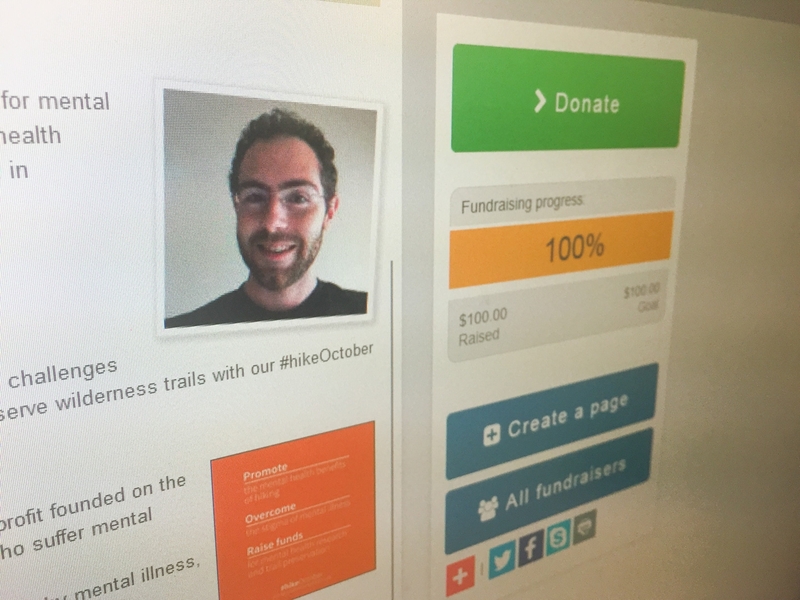 I found Hike For Mental Health who had an existing effort going to “Help us raise awareness of the challenges of mental illness, fund mental health research and conserve wilderness trails with our #hikeOctober campaign.” – Perfect! Already attached to hiking and all I had to do was set up my personal fundraising page by creating a username and password and then asking for pledges! I mostly posted about this on social media and was able to meet my modest goal of $100 in the month of October. I hope these tips give you a glimpse at how easy it can be to hike for charity. Whether you start your own cause or use an app, have fun hiking for a good cause! Please feel free to shoot me a comment below and tell me about some of your charitable hiking experiences. I would love to hear them! Hi Josh – congratulations on raising awareness and funds for your charity, Heart of Many Colors. Contributing to the important conversation about hiking for charity or nonprofit organizations, I’d like to offer the following option my daughter thought up. TinkerBell, AKA Alexa Stillwell – SOBO thru-hiker 2017, started @HikingForNonprofits before setting out from Katahdin on June 8th. Her concept was to ask for financial commitments from FOR profit companies (Annapolis Subaru, Belair Produce, Continental Contractors) to sponsor her hike with 100% of funds going directly to support NON profit organizations (Chesapeake Bay Foundation, Heroes of Tomorrow, and Maryland Federation of Art). Today, Tink will cross the 2,100 mile mark and is greatly looking forward to completing the AT (Springer Mtn) on Halloween – dressed appropriately as TinkerBell! Her goal was to raise awareness of the important work and community value of these dedicated nonprofits and to tap into for profit companies who share in their vision. Tink’s passion for and dedication to the environment is self evident by having spent over 4 months hiking the length of the AT. I can’t think of a better way to support one’s passion than by walking the walk and having so many support your efforts!!! I hope other hikers follow the stellar example set by you, Tink and so many others!!! Wow, Kate – Thanks so much for sharing that! Make sure to tell TinkerBell I think she genuinely turned her hike into something magical! Approaching for-profit businesses is a great idea to fund raise your charity(ies) – thanks for encouraging hikers to give it a try. P.S. Finishing on Halloween… in a TinkerBell costume? That’s perfect. We better see some pics!!!! Joshua, thanks for these insights. 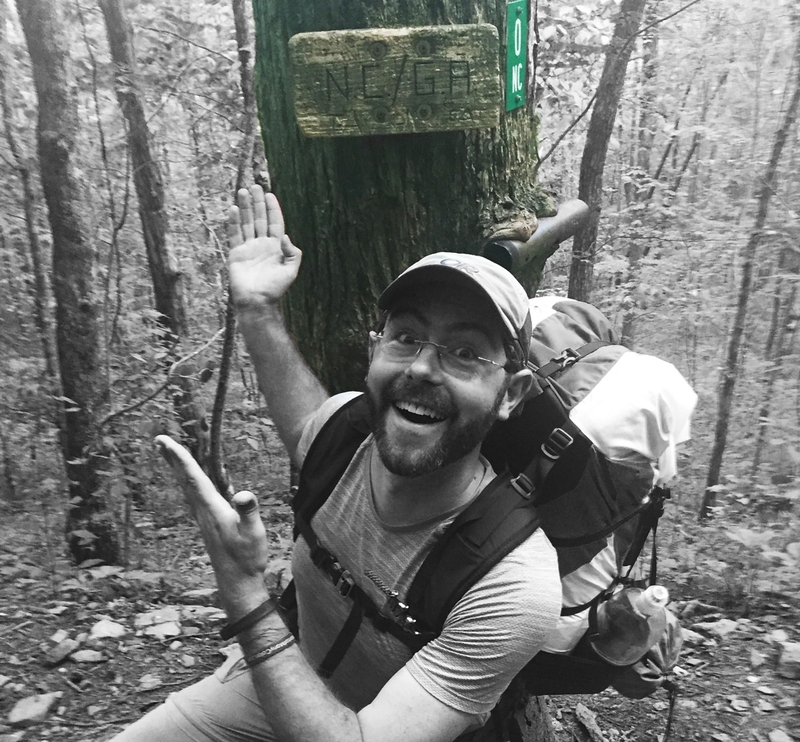 I have decided to make my 2018 thru-hike of the AT a charity hike. It is a tribute to Dr. Edward P Gelmann, Dep. Director for Clincal Research at the Herbert Irving Cancer Center at Columbia University, and will contribute all donations to the Cancer Research Institute (CRI). I am hoping to monetize my YouTube channel, Thru-hiking with Scars, and give people a chance to contribute simply by viewing the videos of my preparation and thru-hike. I have also created donation pages on Patreon and at CRI, for people wanting to join the effort by generating their own milestone, miles or monthly goal-based donations. Although I survived two unrelated cancers myself, I chose CRI because of their focus on immunotherapy research, which is advancing treatment for the most challenging breast and ovarian cancers. Thanks for your charity work, and helping others like me get the word out. Sounds like a great pick, Dan! Good luck on your hike and I’m sure you’ll be able to help CRI with the fundraising options you mentioned above. Do you have an Instagram or anything for us to follow? Let us know! I don’t at this time, social media is new to me and I am just trying to wrap my arms around YouTube. Through that channel, I will put updates out on other social media outlets as my February start date approaches. Thanks again for your insights. Dan, I would encourage you to take a look at what “Dixie” does on Homemade Wanderlust. She does a great job on her YouTube channel and also does a great job using Instagram in a non-annoying fashion to give additional content and drive traffic to her YouTube channel. Instagram adds an extra layer of “discoverability” to your content through the use of topic specific searches (mainly hash-tags). I would encourage you to establish an Instagram and get familiar to boost everything you are doing! – It’s quite easy to use! Josh, nice story here… have run the famous, grueling Empire State Building Stair race 17 times, and the crazy Mt. Washington road race 7 times, earning 35,000.00 for charity in 24 years as a firefighter, …so looking to walk the AT March 5th, 2018, on my 65th birthday for: Make A Wish. Just read 6 books on it. Planning now. Trying to get on TV to submit my walk, and bring 2 or 3 Veterans w/ me who have suffered from war…. That’s pretty epic, Tim! Best of luck on your AT start and I hope it makes a huge impact for Make-A-Wish. What a way to celebrate 65 years! Hi Josh we are a group of social hikers in pretoria South Africa the name of the group is Khuphuka Juluka Uphole. We want to start hiking to change or touch lifes how do we start doing that? We have been hiking for about 3 years now once in a month but we know its possible and we would love to do this more meanongful. Well, i’m unfamiliar with the region, but like the article says: Pick a charity, get the word out however you can that you are raising money for that charity and collect the money (before or after your hike), donate the money to your charity. 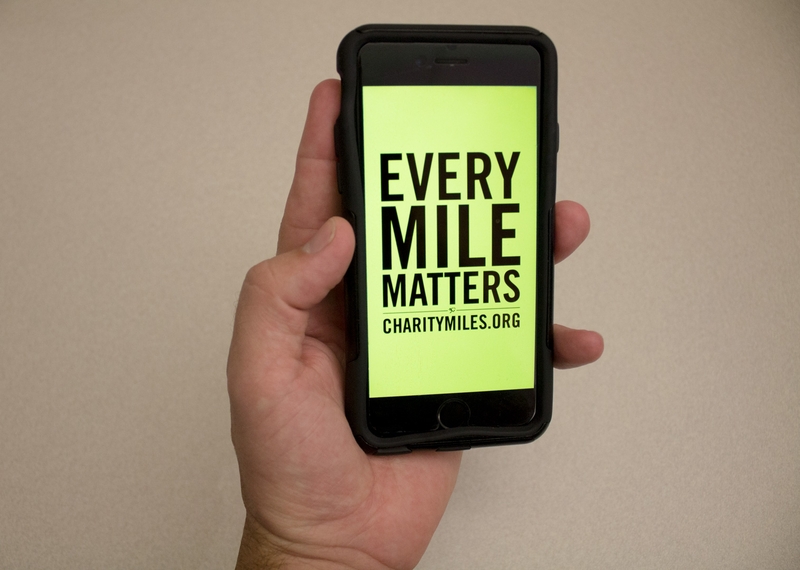 If the “Charity Miles” app is available in you region, then that is an easy way to contribute as well.